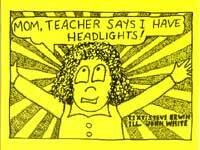 Mom, Teacher Says I Have Headlights! Cartoon story of child sent home from school because of head lice. Mother helps the child to understand bugs are everywhere.